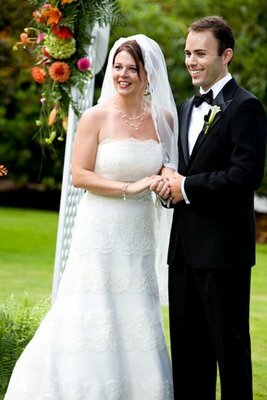 When Courtney Gregoire and Scott Lindsay were married in August of 2008, it was the first wedding ever held at the 100-year-old Washington State Governor's Mansion overlooking Capitol Lake in Olympia. 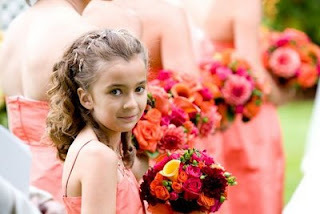 Courtney's mother is Washington's Governor Christine Gregoire. 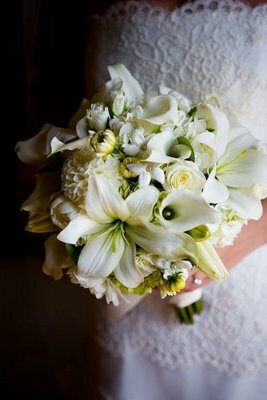 The staff at Lynch Creek Farm is proud that beautiful dahlias from the Farm were featured in the wedding. Floral designer Colleen Hunter of Lynch Creek Floral in Shelton was chosen to provide the bride's personal flowers and the floral decorations for the outdoor ceremony. Seattle-based wedding photographers Kim and Adam Bamberg (La Vie Photography) captured the day for the couple, and posted a generous sample of their photographs as a blog on La Vie's website. Kim and Adam, known for their artistic wedding photography, high-fashion photos and portraiture, "turn passion into pictures." They also do high-fashion photos and portraiture, and Kim is the art director and founder of Junebug Weddings. 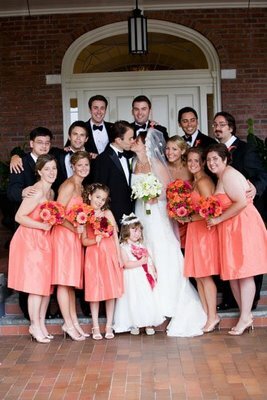 Their work has been featured in Bride's Magazine, Seattle Metropolitan Bride and Groom Magazine, Seattle Bride Magazine, Eliza Magazine, Your Wedding Day, The Washington Post and The Knot. The Gregoire wedding offered lots to work with: a photogenic wedding party, lovely setting of the red brick Georgian-style built in 1908 on the crest of Capitol Point with its white pillars, sloping lawns, and elegant grounds. And of course there were the beautiful waterlily, ball, decorative and pom pon dahlias in the bride's chosen colors, vibrant shades ranging from orange to pink and deep rose, as well as white dahlias in the bridal bouquet. Dahlias clustered on a lavishly flowered archway under which Courtney and Scott exchanged vows. 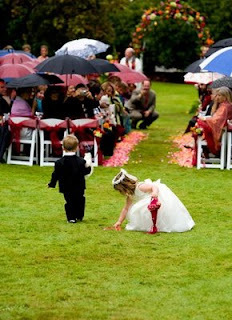 The day itself must have been an interesting challenge to wedding party and photographers alike, with rain threatening and, at one point, even sprinkling on the gathered guests and attendants. (Even the umbrellas were color-coordinated!) But as the bride walked down the petal-strewn aisle, the sun emerged, as the sun always should on lovely couples on their wedding day. It was a brilliant occasion, and Lynch Creek Farm is honored to have had a part in Courtney and Scott's lovely day.